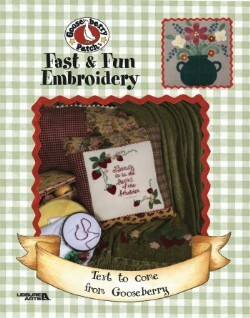 Fast & Fun Embroidery - embroidery with fabric! Guess who's improved upon old-fashioned embroidery? The folks at Gooseberry Patch present 28 projects that retain all the creative fun of vintage stitchery, yet finish in a flash. Make pillows, throws, mugs mats, cushions, and lots more! Leaflet - 36 pages by Leisure Arts.